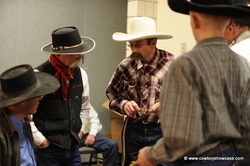 The 28th National Cowboy Poetry Gathering took place January 30 to February 4, 2012, in Elko, Nevada. This year’s theme was Southwest Ranch Country. The programs focused on the southwestern United States, specifically Arizona and New Mexico, states that are celebrating their centennials this year. This theme was highlighted at the exhibition that opened in the Western Folklife Center's Wiegand Gallery during the Gathering. The exhibit, on display from January 24 to September 8, 2012, features photography by Kurt Markus of Kalispell, Montana and Jay Dusard of Douglas, Arizona. Their portraits of working cowboys of the American Southwest and its majestic sweeping landscapes capture the flavor of the ranches of the Southwest. Also displayed is handcrafted gear made by some of the region's master craftsmen, including braiders, silverworkers, weavers, and leatherworkers. This exhibition depicts ranch-related craftsmanship and brings together some of the finest Southwest artists and the work they enjoy doing as either occupation or sideline. 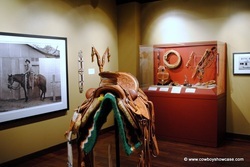 During the Gathering, the gallery featured slide shows and gallery tours by Jay Dusard and Arizona cowboy poet Ross Knox, and leatherwork demonstrations by master saddle makers Don Butler, Bob Park, and Andy Stevens. In addition to the Southwest Ranch Country exhibition, the Gathering presented poets, writers, and musicians from the region, as well as more than a dozen workshops and panel discussions focused on regional food, gear making, culture and contemporary ranching issues. Participants have the opportunity to be taught new skills, explore and gain knowledge of meaningful and interesting topics, and have a chance to meet artists and performers and others who share similar interests. A perennial favorite is the Rawhide Hobble Braiding workshop with Nevada buckaroo Doug Groves. In this four-day workshop the students learn all aspects of rawhide braiding from the harvest of a suitable cowhide through the string-making process, to the finished product that this year was a set of rawhide hobbles. Another popular workshop was Traditional vs. Contemporary Hat Making with master hatmaker Roy Jackson, of Jaxonbilt Hat Co., Salmon, Idaho. Participants of this three-day workshop learned the art and craft of hat making without machines using methods that have changed little since the 1800s. A set of discussion groups that highlighted the very important and current problems of the southwest began with a session called A Border Runs Through It: The Southwest that included panel members Jim Griffith, Gary Nabhan, Thomas Sheridan, and Gail Steiger. The title for the session was taken from Jim Griffith’s book of the same name. In this session, the problems facing “border” states were addressed. Borders mentioned were not only the obvious international border with Mexico, but state, federal, and tribal borders, as well as cultural borders. Landowner associations were seen as one way of bringing diverse people to a compromise with bureaucratic functions. A number of current problems such as illegal drug traffic and environmental regulations were discussed and solutions were suggested. Two more associated discussion groups were Crossing Boundaries: Ranching in the 21st Century Parts 1 and 2, a 2 1/2 hour session including panel members William McDonald, Pat O’Toole, Sharon O’Toole, Thomas Sheridan, Kent McAdoo, and Meghan Brown. The moderator was Thomas Sheridan. Nevada Humanities, Jennifer Speers, and Northeastern Nevada Stewardship Group sponsored the sessions. On Wednesday February 1, Cowboy Poets performed at the Elko Convention Center for 1,900 area school children. Hal Cannon, founding Director of the Western Folklife Center, says that the demographic age of the people who attend the National Cowboy Poetry Gathering has always been the same as his age. He was born in 1948. Encouraging participation by young people is aimed at changing this. 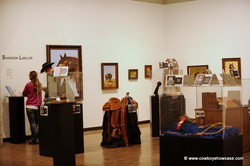 Visit	www.westernfolklife.org for more information about the National Cowboy Poetry Gathering and the Southwest Ranch Country exhibition. Call 775-738-7508, toll-free 888-880-5885, or stop at the Western Folklife Center, 501 Railroad Street, Elko, Nevada.